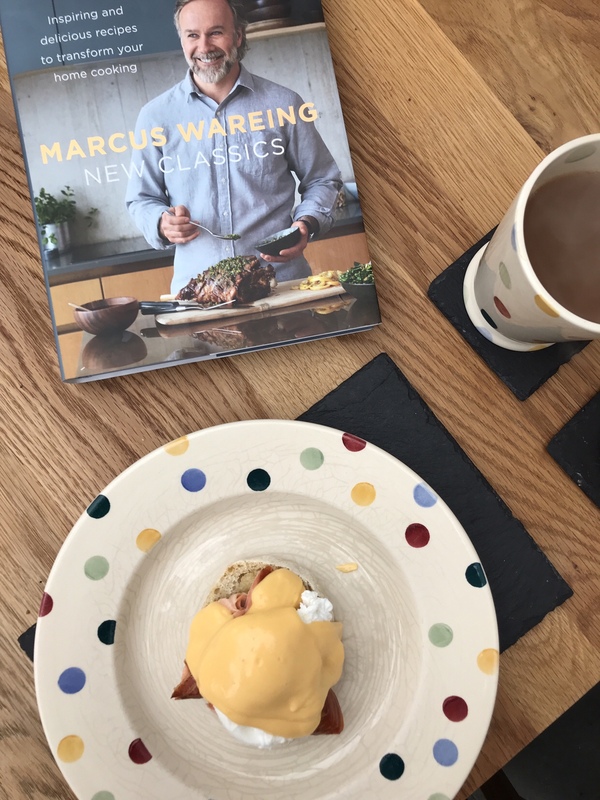 I love Marcus Wareing’s new book of ‘New Classics’ – a Christmas present from Andrew. 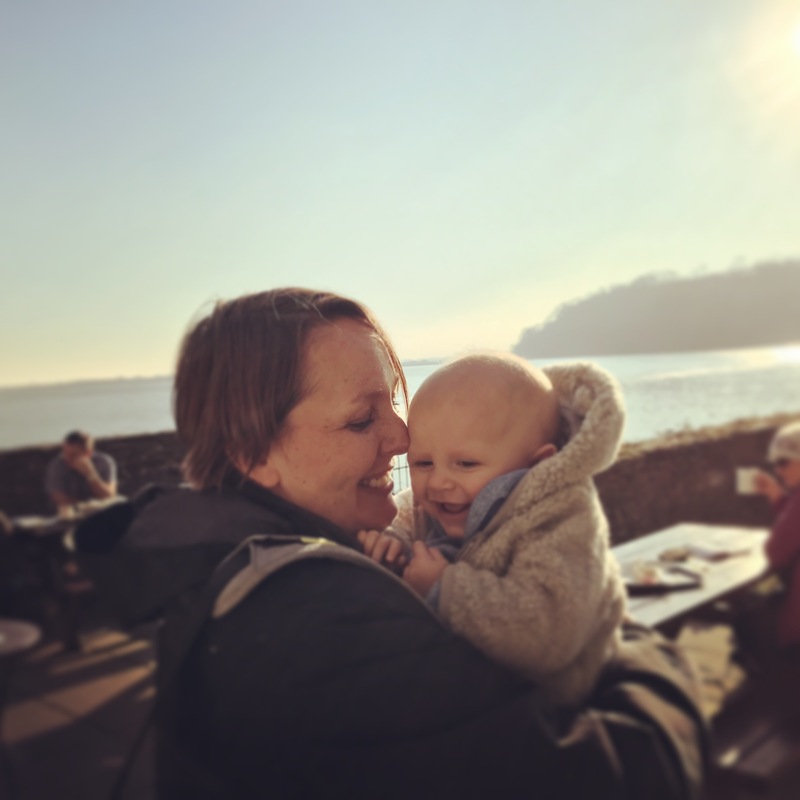 I have already made a couple of recipes from there, including cod goujons in parmesan crust (Ioan adored them), but I ate them too quickly to photograph for a write up. 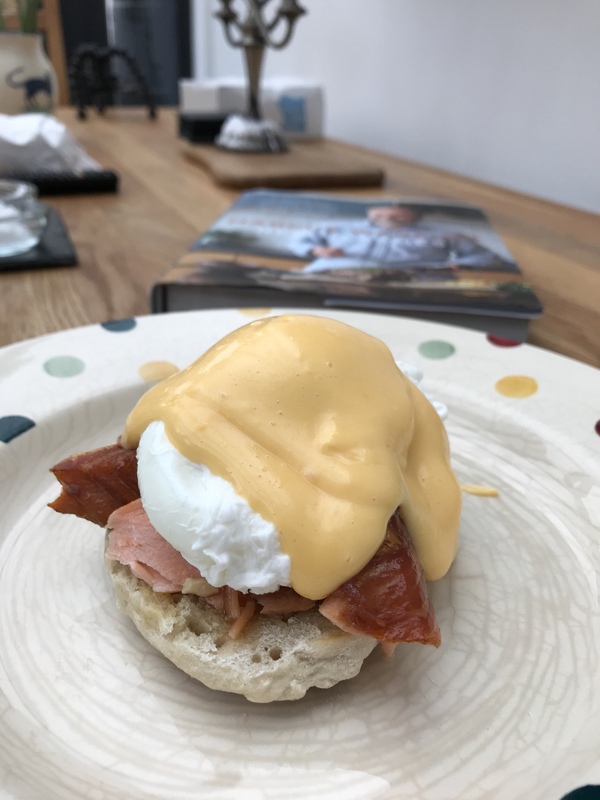 I have previously mentioned our delicious hot smoked salmon from a local fishmonger, and I bought some to make this hot smoked salmon eggs Benedict. I always make English breakfast muffins each Christmas (Andrew likes to have eggs Benedict on Christmas Day), but I have never made hollandaise sauce before … mainly because I like Maille hollandaise sauce, and I am not convinced that the faff of making hollandaise sauce is worth the effort (plus do you really want to know how much butter is in your breakfast?). Anyway, back to the eggs Benedict. 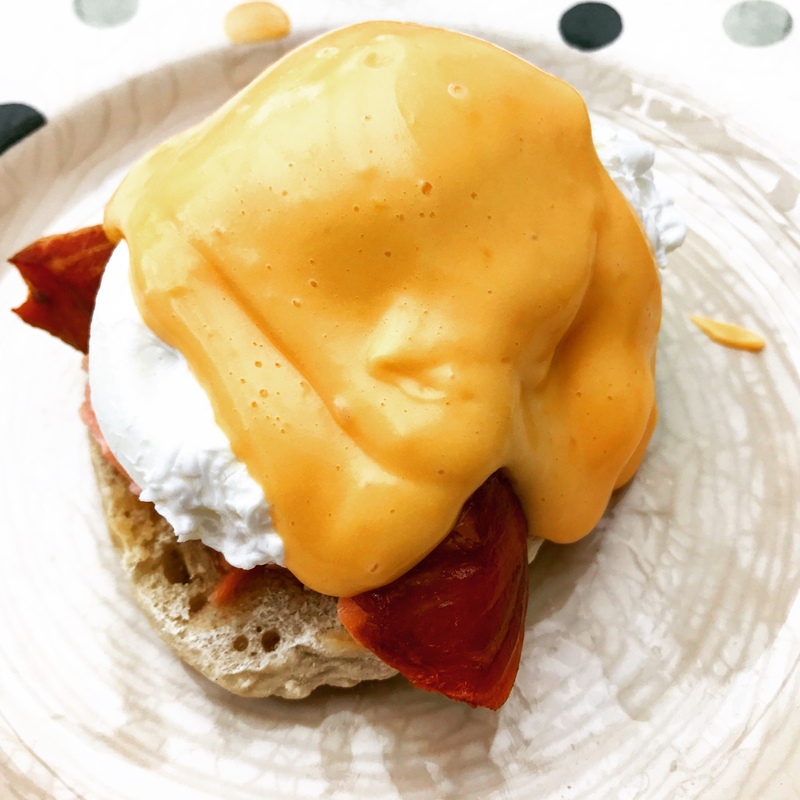 You need to be prepared when making a sauce like a hollandaise, so I had the muffins sliced and ready to toast, the hot smoked salmon flaked, and the eggs ready to poach (here’s an easy step-by-step guide to poaching eggs in case you need a tip). I decided to make the hollandaise before poaching the eggs, as Marcus said you just need to cover it and it will stay good. It did! So, I am just going to give you the recipe for hollandaise sauce (my way of making it) as the rest of the dish is pure assembly. And by the way, Marcus says this serves 4 people (one muffin and two eggs each). 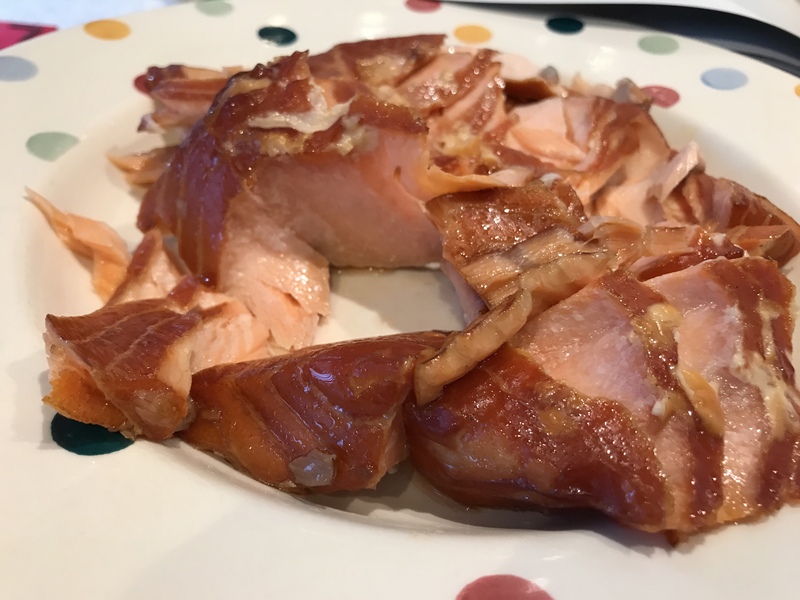 Hot smoked salmon is so rich and filling, that I think you only need half a muffin (and one egg) per person … I did a greedy portion for us as per Marcus’ instructions and it was so filling … but we needed all the sauce (which he says would be enough for double the amount of muffins and eggs). 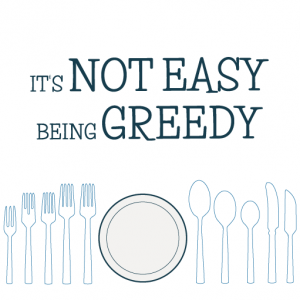 So just saying that the portion sizes are a little out … or I am too greedy on the old hollandaise sauce front. Chop the onion and put it in a saucepan with the thyme, white wine vinegar, water and fennel seeds. Bring to the boil and simmer until the liquid has been reduced by half, and then strain the reduced liquid into a heatproof bowl. Melt the butter (I did this in a microwave for around 45 seconds) and set aside so that the milk solids sink to the bottom (as you only want to use the clarified yellow butter – not the white bits that sink). Now you need to slowly cook the egg yolks while adding the melted butter: put a saucepan which is a third filled with water on to simmer, and balance the heat proof bowl (with the reduction still in it) on top. Add the egg yolks to the reduction and whisk them together until light and fluffy, while the water is still simmering underneath the bowl. Start adding the butter slowly, whisking the eggs well each time, until the butter is absorbed into the eggs. You need to be careful that you keep whisking constantly otherwise the eggs will start to scramble. The sauce will start to thicken, but if you think it might be thickening too quickly, just take the bowl off the heat and keep going with the butter. You probably know the thickness of hollandaise sauce, but if not, its basically thick mayonnaise. Once all of the butter is whisked in, you can add lemon juice, salt and pepper to taste. I used jif lemon from the cupboard to season mine, and used around a tablespoon. Cover the bowl with clingfilm while you assemble the dish. 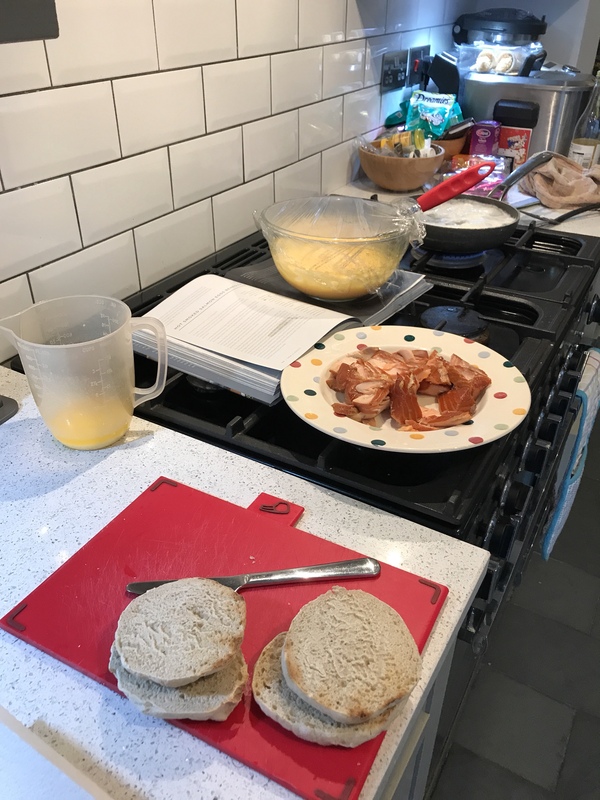 So, get those muffins toasted and then flake the fish onto them (no need for butter on the muffins as the salmon is oily). Put a poached egg on top and then spoon your hollandaise on top. You have a bay tree outside your front door!